Sometimes circumstances conspire to cause problems getting your fire lit or hot enough to burn cleanly. What ever the reason a good step to try and remedy it is to split your logs down to a smaller size. 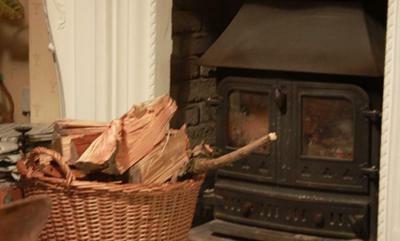 If you buy firewood it is likely to be split to a larger size than most stoves burn comfortably. Taking the time to split again can save heartache if you are struggling to get your fire burning well. I used this tip myself this week when visiting my inlaws over christmas. Their old wood burning stove, which came with the property, has a very small firebox and at best they were struggling to fit a single log into the stove. A single log rarely burns as well as a few splits as it doesn't get hot enough. After 30 minutes with a nice sharp axe I had split the worst of the oversized logs down to a more sensible size for the stove - around wrist thick in this case. Now rather than loading up with one single log we can load up with three or four nice splits. The net result? A much easier, hotter and more efficient fire. It was safer too as we weren't risking life and limb trying to fit mis-shapen logs in, which previously seemed determined to throw themselves back out again. In this case we were working with nice dry, well seasoned logs, but this trick can also help if your firewood isn't quite as well seasoned as it should be. I just got my wood splitter built, up & working. Still more to do before it is "finished". Had to quit splitting by hand as my shoulder just would not take the abuse. Split wood burns hotter and faster than round. My stove has a large fire box, if I want a hot fire it gets loaded with split wood. For a longer slower & colder burn I load up with round logs. One poster said he had been tossing hunks, chunks, knots and bark away. What a waste, for the last 10 days or so almost all my heating has been done with that kind of wood. All wood is heat and bark is hot burning as a fire starter. Your posts are always informative and I appreciate that. Do you think that there is anything such as a dissertationsguru? I am of the opinion that different writers have varied strengths and these come in handy in different ways when it comes to writing. That i would like to get some sort of composition regarding extremely simple realize. That i was initially browsing thru two or three webpage together with happened upon essay writing service. Happen to be these well-performing and may That i check out him or her released. My organization is at a simple deadline together with is unable to afford to pay for to choose unacceptable creator. Now, from the behold of beings, it is unobstructed that persons are exploring it stiff to discover worthy further literature essay writing service positions. Well enable me to advert them to thesis-treatise-dutys-online.blogspot.com. Here you can have the papers needed also square comprehend to provide your feedback on the process delivered.